Apple sells some pricey hardware, everybody knows it. That's why iOS devices are at the top of muggers and robbers lists. 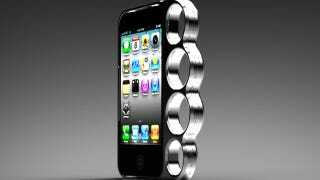 So what better way to protect your phone than to integrate it into a vicious melee weapon. Which of Your Gadgets Is Worth Fighting for?